I was obsessed with Ghostbusters growing up, a fact that should surprise nobody. The film lent itself to a child’s obsession with its special effects, its cool gadgets, its all-star cast, and the fact that it hit in the peak-VHS era where movies were all of a sudden watchable (and re-watchable) on demand. 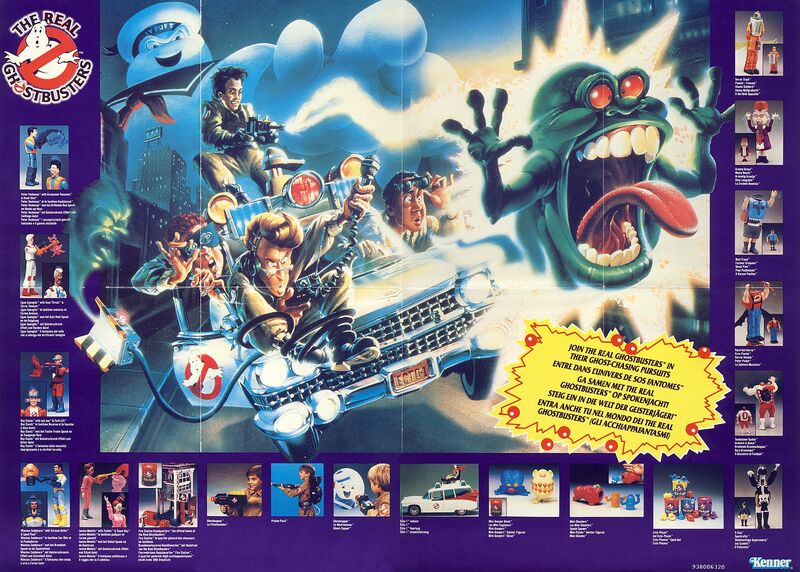 My personal experience with playing Ghostbusters was mostly relegated to imagination-fueled repurposing of household items, like the vacuum-hose proton pack and the shoebox ghost trap, as the toy component of the franchise didn’t really kick in until the Real Ghostbusters cartoon series premiered in 1986. This commercial for the foot-activated ghost trap actually features some other products as well. The wiggly-wobbly proton pack was a staple in the playrooms of the wealthier kids in my neighborhood. The “Ecto-Popper” is a pretty dumb idea, though. My PKE meter was a battery tester, and I prefer that to this technicolor monstrosity. The Real Ghostbusters had a lot going for it on its own as a toy line. The show expanded both the gadgets the Ghostbusters had at their disposal and the array of ghosts available to bust – expansions that can grow into an endless toy line. The idea of a show artificially growing its universe to make room for more toys isn’t necessarily noteworthy, though; what The Real Ghostbusters had in their favor was that these gadgets and new ghosts were actually pretty cool and they organically fit into the universe. It was pure marketing, but it felt genuine and not clinical. Egon knew what he was doing in the Firehouse lab, and Tobin’s Spirit Guide turned out to be pretty comprehensive. They weren’t all smash-hit creative ideas (looking at you, Granny Gross), but there’s definitely an effort here. This introductory commercial sticks pretty closely to the movie vibe even though it’s clearly the cartoon character models. Where’s Winston? Here’s the aforementioned Granny Gross along with one of my favorite new vehicles, the Ecto-2 personal helicopter. In this ad some really odd casting decisions show off Louis’s Power Pincers, the Mean Machine, Terror Tongue and the Ghost Sweeper. The Firehouse isn’t the most exciting playset in the world, but you can’t really have the Ghostbusters without it. Add some slime, though, and you’re good to go. It would have been great if they had a reactor that could melt down and spit a bunch of ghosts into the room. This one tries to align itself with the plot of Ghostbusters 2 a little too closely to be coincidence. The water-based play and the Ghostbuster suits that reveal “slime” when they get wet reflect a weird direction for the franchise to take, though. The best Ghostbusters toy and ad, without question, is the Ghost Zapper. These kids have great comedic timing and the projector-based light blaster is some next-level stuff. What did I miss? What was your favorite deep-cut Real Ghostbusters ghost or toy? Let me know!